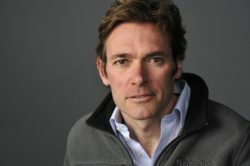 North Carolina State University’s Park Scholarships Class of 2019 hosted the program’s inaugural Gerald H. Elkan Distinguished Lecture in Science and Society, featuring MacArthur Fellow and water quality engineer Dr. Marc Edwards, on Tuesday, March 21 from 5:30-6:30 pm. The lecture, entitled “Truth Seeking by the Lights of Perverted Science: Exposing the Flint Water Disaster,” was held in the Hunt Library Duke Energy Hall, and a reception immediately followed. Both the lecture and reception were free and open to the public. Those unable to attend may watch a recording of the lecture. (Note: please download Microsoft Silverlight to stream the lecture live.) The Park Scholarships program presented this event with support from NCSU Libraries and the R. L. Rabb Science and Society Symposia. Edwards is the Charles Lunsford Professor of Civil Engineering at Virginia Tech, where he teaches courses in environmental engineering, applied aquatic chemistry and engineering ethics. His research group aspires to pursue science as a public good, through laboratory work on practically important but underfunded topics such as corrosion in buildings and opportunistic premise-plumbing pathogens. His group’s research laid the groundwork for investigative science uncovering the 2001-2004 Washington, D.C. Lead Crisis and the 2014-2016 Flint, Michigan Water Disaster. For Edwards’ role in bringing to light unsafe conditions in these cities’ drinking water supplies, TIME, Fortune, Politico and Foreign Policy magazine named him among the most influential people in the world in 2016. Edwards received a B.S. (1986) from the State University of New York at Buffalo and an M.S. (1988) and Ph.D. (1991) from the University of Washington in Seattle. The Gerald H. Elkan Distinguished Lecture on Science and Society was established by its namesake’s former students, associates, and friends in honor of Elkan’s 40-year career as a microbiology professor in NC State’s College of Agriculture and Life Sciences. This lectureship supports an annual talk at NC State by a prominent thought leader. Elkan has been heavily involved with the Park Scholarships program since 1997. He and his associates worked closely with the Park Scholars to select Edwards as their first Gerald H. Elkan Distinguished Lecture on Science and Society speaker.